At the Wisconsin Film Festival I saw the best film I’ve seen over the last six months. I can’t really say much about it, but I’ll do what I can. My remarks make most sense, I think, if I embark on a pretty long detour. 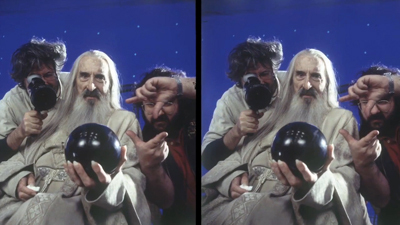 3D still photographs by Peter Jackson taken during the filming of the Lord of the Rings trilogy. In the wake of April’s convention of the National Association of Theater Owners, the biggest press tumult surrounded Peter Jackson’s ten-minute demo from The Hobbit. Fulfilling what James Cameron had called for at the 2011 NATO confab, Jackson has been shooting at 48 frames per second, and the demo was screened at that rate. Cameron and Jackson are concerned that there’s too much image judder and strobing in digital cinema, especially 3D. They propose a higher frame rate to smooth things out. Opinion on the Hobbit footage was divided. Some theatre owners and operators were happy with it, but others were uneasy. The higher frame rate tends to eliminate motion blur and create a sharpness that recalls, for some viewers, the brittle look of HD sports broadcasts. “It looked to me like a behind-the-scenes featurette,” said one. Jackson, who has been preparing for this initiative on his Facebook page, defended his decision. He maintains that audiences will adapt to it, just as his production team has. Many exhibitors seem to have dismissed the new initiative as too expensive, particularly at a time when many are still paying off the digital conversion. But the Regal Entertainment Group, the largest cinema chain in the US, announced plans to outfit up to 2700 screens so that The Hobbit can be screened at 48 fps. It now seems possible that The Hobbit may be shown in no fewer than six formats: 2D, 3D, and Imax, and in each there will be both 24 fps and 48 fps presentations. Not being present to watch the footage, I have to withhold judgment about how it looks. I haven’t though, withheld my opinion about how Cameron and Jackson, along with George Lucas, have used their roles as superstar directors to prod exhibitors to adopt expensive new technology. They acted as the figureheads for the switch to digital in 2005, using 3D as the incentive for exhibitors to convert. A few years later, after proposing 3D television, Cameron upped the ante by urging higher frame rates for film. Jackson has joined him by actually making a film at 48 fps. Cameron has said he prefers 60 fps, which may mean that the goal posts get shifted again when Avatar 2 or something else comes along. You can go to my earlier post for more thoughts on their tactics. My book on the digital conversion, due out on this site in a few days, offers a fuller account. In the meantime, I’m going to try to understand this frame-rate fracas in a wider historical context. Cinema technology has been surprisingly stable, as befits its status as the last surviving nineteenth-century engine of popular entertainment. The dimensions of the film strip, the rate of shooting and showing, and other fundamental factors have altered relatively little. The coming of sound and then the replacement of nitrate-based film by acetate are perhaps the biggest alterations in the basic technology. Below this macro-level, though, innovation has been constant. From the 1920s through the 1960s, most of the change came in the production sector. The adoption of panchromatic film stock; color processes, principally Technicolor and the monopack systems like Agfacolor and Eastman Color; the development of various lighting units (carbon-arc, incandescent, Xenon); the shift from optical sound recording and reproduction to magnetic processes; the emergence of different sorts of camera support (varieties of tripod, dollies, and cranes, along with handheld devices)—all of these shaped how movies were made but had relatively little effect on how they were shown. Some 1950s innovations launched in the production sector, notably widescreen cinema, stereophonic sound, and 3D, reshaped exhibition more drastically, because they came at a moment when theatres were anxious to lure back their clientele. Other revampings of exhibition, like wide-gauge film (65mm/70mm) and Cinerama, were never intended to be the universal standard. They were designed for a distribution system that included roadshow exhibition. Dedicated screens showcased big films like The King and I and Lawrence of Arabia for long, well-upholstered runs before the film hit the neighborhoods and the suburbs. Producers innovate and exhibitors hesitate. Exhibitors must be cautious and conservative; they risk revamping their venue at great cost only to find that the new technology isn’t catching on. The roadshow system repaid exhibitors well, until it collapsed in response to the rise of saturation booking in the 1970s. For similar conservative reasons, exhibitors looked askance at the digital sound reproduction technologies that emerged from the 1970s through the 1990s. At one point, a house had to accommodate four different sound systems, some of them subject to periodic upgrades. When technologies emerge in the production sector, they mostly promise to enlarge the filmmaker’s palette. A 1950s film could be made black-and-white or color, deep-focus or soft-focus, with arc or incandescents, flat or anamorphic, and so on. In practice, of course, not everything was possible on every project. Budgets, as ever, limited options, and many directors and DPs disliked shooting in color or CinemaScope but were obliged to do so. And there were some trade-offs. Filmmakers of the 1930s could not shoot on orthochromatic stock, and after the mid-1950s, it was hard to make a film destined for the classic 1.37 Academy ratio. Still, there were few absolutely forced choices, and many directors explored different options from project to project. The prospect of an enhanced palette is in fact one reason that some filmmakers embraced new technologies. Sergei Eisenstein (who trained as an engineer) was eager to try out sound, color, and even television because they expanded creative choice. Orson Welles saw in the RKO effects department, which had pioneered sophisticated optical-printer work, a way to create images that couldn’t be generated in the camera. As is now widely known, many of Citizen Kane’s most famous “deep-focus” shots were achieved through special effects. Similarly, Stanley Kubrick renewed the power of his images through his eager adoption of new technologies, including long lenses for Paths of Glory, the handheld camera in Dr. Strangelove, faster lenses for Barry Lyndon, and the Steadicam for The Shining. These filmmakers wanted to multiply options, not foreclose them. The changes that Cameron and Jackson propose are more sweeping. Now that digital projection is an accomplished fact, there will be backward pressure to create a wholly digital workflow. Filmmakers who want to shoot on 35mm will be reminded that they will eventually be fiddling with a digital intermediate, and that the final version will be digital, not film-based. 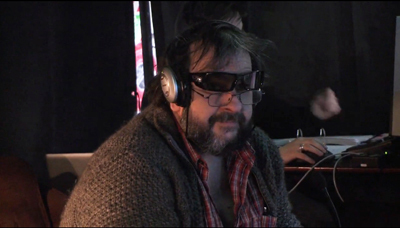 A selling point of digital cinema to the creative community was the promise of complete control over the film’s look and sound, so that the audience gets exactly what the filmmaker envisioned. To assure that integrity, the director will have to shoot and finish the project on digital. That will take away an entire dimension of choice—specifically, shooting on film. In contrast to Scorsese’s offhand pluralism, Cameron, Jackson, and their confrère Lucas may be creating a scorched-earth policy. Their conception of cinema, I would say, is now largely that of the Gearhead. Their notion of artistry has become quite mechanical, in that they see progress to depend almost wholly on improved hardware (and software). They represent three mini-generations of Hollywood techno-lover: Lucas, who began in animation; Cameron, who started as a model-builder; and Jackson, the 1980s fanboy who played with King Kong action figures. They are directors who treat cinema as a delivery system for stories grounded in genre conventions. Fantasy is their touchstone, and realism of any sort bears only on how vividly we perceive the images, not what the films show or say or suggest. You have news footage, you have documentary footage—which are supposedly realistic images—and then you have movies, which are completely fantasy images. There’s nothing in a movie that’s true or real—ever . . . . The people in the movie are actors playing parts. The characters are not real. The sets are not real. If you go behind that door you’ll see there’s no building—it’s just a big flat piece of wood. Nothing is real. Not one little tiny minutia of detail is real. The Hollywood cinema was then putting fantasy and special effects at the center of its aesthetic, and Lucas understood that every film—action picture, romantic comedy, even dramas—would rely on special effects to a new extent. Here’s Cameron saying the same thing in defending 3D in 2008. Godard got it exactly backwards. Cinema is not truth 24 times a second, it is lies 24 times a second. Actors are pretending to be people they’re not, in situations and settings which are completely illusory. Day for night, dry for wet, Vancouver for New York, potato shavings for snow. The building is a thin-walled set, the sunlight is a Xenon, and the traffic noise is supplied by the sound designers. It’s all illusion, but the prize goes to those who make the fantasy the most real, the most visceral, the most involving. This sensation of truthfulness is vastly enhanced by the stereoscopic illusion. It’s hard to believe that Lucas and Cameron don’t know the long tradition of debate in the arts about realism. Realism can be considered a question of subject matter, plot plausibility, random detail, psychological revelation, and many other things; it isn’t just about trompe l’oeil illusion. Moreover, documentary and experimental filmmakers have suggested that cinema can capture moments of unplanned truth. And André Bazin and others have argued that even when presenting fictional tales, photographic cinema gives us unique access to some essential qualities of phenomenal reality. For Bazin, even an awkwardly shot scene could preserve the sensuous surface of things with a conviction that no painterly manipulation can equal—not perfection but brute facticity. Instead, Lucas and Cameron offer a Frank Frazetta notion of realism: glistening, overripe, academically correct rendering of things we’ve seen many times before. 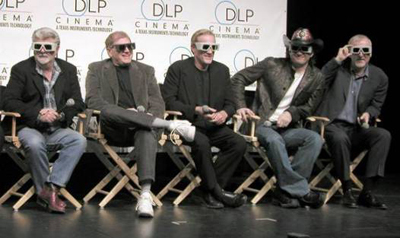 NATO’s 2005 ShoWest convention: Lucas, Robert Zemeckis, Randal Keiser, Robert Rodriguez, Cameron. I see a valid place for a cinema of splendor and spectacle, especially in certain genres. There’s nothing wrong with seeking new methods of pictorial representation, as Spielberg did in Jurassic Park, a genuine triumph of veridical realism. Nor am I trashing Lucas and Cameron wholesale; I admire their early films a fair amount. But they’re forcing their conception of cinema on all filmmakers. 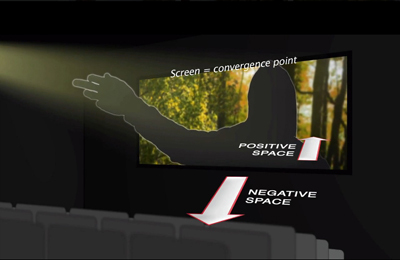 It is intuitive to the film industry that this immersive quality is perfect for action, fantasy, and animation. What’s less obvious is that the enhanced sense of presence and realism works in all types of scenes, even intimate dramatic moments. Both directors usually add that they’re not insisting that every film is suited to the new bells and whistles, that it has to suit the plot and so on—the usual boilerplate about the primacy of “story.” “Stereo [imagery] is just another color to paint with,” says Cameron. Every time I watch a movie lately, from 300 to Atonement, I think how wonderful it would have been if shot in 3D. You get used to this new look [48 fps] very quickly. . . Other film experiences look a little primitive. I saw a new movie in the cinema on Sunday and I kept getting distracted by the juddery panning and blurring. We’re getting spoilt! . 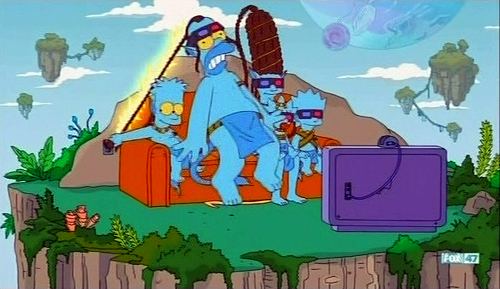 . . There’s no doubt in my mind that we’re headed toward movies being shot and projected at higher frame rates. As happened before, the pronouncements of the directors mesh well with the initiative of the manufacturers. Back in 2005, Cameron, Lucas, Jackson, Robert Rodriguez, and Bob Zemeckis took to the NATO stage to help sell the Digital Cinema Initiatives program to skeptical exhibitors. Their support (and the box-office numbers of the 3D Chicken Little) aided the projector manufacturers Christie, Barco, NEC, and Sony in rolling out units. The number of digital screens in the US and Canada jumped from ninety in 2004 to over 300 at the end of 2005. This year, with about two-thirds of all US screens fully converted, Christie circulated a promotional leaflet tied to Jackson’s demo. A few years ago, the future was all about 3D, but now, the text states flatly, “The future of cinema is all about high frame rates.” The cards are on the table. At just 24 FPS, fast panning and sweeping camera movements that are a critical part of any blockbuster are severely limited by the visual artifacts that would result. . . . The “Soap Opera Effect” has been derisively used to describe film purist perceptions of the cool, sterile visuals they say is [sic] brought on by digital. But the success of Hollywood, Bollywood and big-budget filmmakers around the world has little to do with moody art-house films. The biggest blockbusters are usually about immersive experiences and escapism—big, vibrant, high-action motion pictures. Beyond the simple turnstile dynamics of “must-see” movies, a new, higher standard of movie-going should support premium pricing. Managed right, hotly-anticipated 3D HFR should empower ticket up-charges. Lucas and Cameron, and then Jackson, grasped that if cinema technology went wholly digital, it would change in fundamental ways. It would turn a medium into a platform, like a computer operating system. The most basic technology of showing a movie would become subject to rapid, radical, ceaseless remaking. It would demand versions, upgrades, patches, fixes, tweaks, and new software and hardware indefinitely. I’m not sure that NATO’s members have fully realized this. They went into the deal lured by the chance to raise ticket prices and thus offset flat or slumping admission numbers. But attendance is still stagnant, even with the occasional stupendous successes like Avatar and The Avengers. Interestingly, AMC, one of the Big Three circuits that invested heavily in digital projection, is reportedly in talks to sell out to Chinese investors, and other chains are on the auction block. The studios are proceeding with VOD plans that may thin theatrical attendance even more. Meanwhile, exhibitors face a long future of payouts. When cinema goes IT, as Steve Jobs might put it, we should expect a big bag of pain. I saw Morteza Farshbaf’s Mourning (Soog) on a so-so DigiBeta copy at the Wisconsin Film Festival. This Iranian feature was shot on some godforsaken digital format, certainly nothing that Cameron and Company would approve. For all I know, its camera movements may have strobed unacceptably. I didn’t care. Cameron et al. claim to worship the god of Story, but no film they’ve made has this subtle a grasp of narrative. Mourning gives us a plot so full of twists—in terms of what happens and how we learn about it—that I can’t summarize even the basic situation without subtracting some of your pleasure. 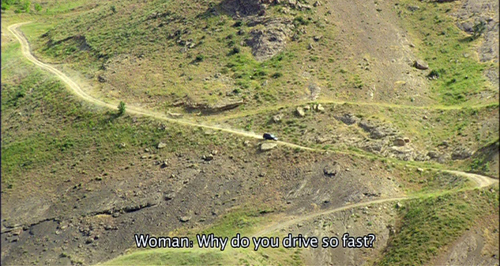 A man and a woman are driving a little boy through a landscape. That’s about all I can tell you. The film critics at Christie would consider it a moody art-house film. It’s also simple, suspenseful, and surprising, even shocking. It is formally inventive, emotionally poignant, and respectful of its characters and its audience. It is gentle but also unflinching. It’s the closest thing to Chekhov I’ve seen onscreen in a long time. Was I immersed? Yes, but not in the way Cameron et al. define that state. I was trying to figure out what had already happened, what was happening at the moment, and what might happen next. And maybe I wasn’t seeing things “realistically,” in the 3D sense, but I was seeing something that captured the world we live in—our surroundings (and their stubborn physicality) and our relations to others. That world was also poetically heightened through the most straightforward means: camera placement, lighting, cutting, sound design. The film was, in other words, working in ways that we have always considered central to cinema’s creative mission. Mourning is part of the fine Global Lens program of circulating features. Here’s a schedule of where and when films in the program are playing. Ask your local festival or art house to book Mourning, or try to see it when it’s available online or on disc. It’s even worth an upcharge. After writing this, I found that Devin Faraci of Badass Digest has a vigorously critical entry on the footage and even calls Jackson and Cameron “gearhead directors.” So I can’t claim originality, but it’s nice to know I have a badass ally. Thanks to Jim Cortada, author of the forthcoming Digital Flood and Co-Director of the Irvington Way Institute, for explaining IT matters to me. P.S. 11 May: Christopher Nolan, still embracing film-as-film, claims he’s no gearhead. This entry was posted on Sunday | May 13, 2012 at 11:19 pm	and is filed under Digital cinema, Directors: Cameron, Directors: Jackson, Film comments, Film history, Hollywood: The business, Movie theatres, National cinemas: Iran. Responses are currently closed, but you can trackback from your own site.